Sadly this not about pop stars drinking fancy coffee, but yet another post about my “Last Ride of the Year”. Drop off the junior ski instructor at Vallee Bleue again and then suited up for another climbing session through the back roads of the Lower Laurentians. 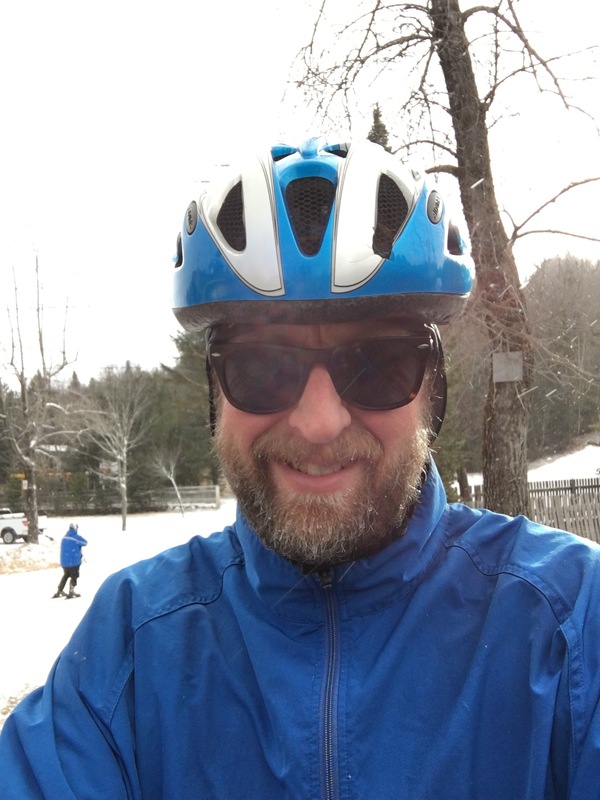 I left the bike by the car while I got dressed in the Ski Lodge… BTW, ski hills should seriously consider that as an off season money maker. Well I got back to the bike for the ride only to notice the rear brake one frozen open. No amount squeezing could do thing, so I plodded on to Espresso Sports in St-Adele (post title) and the bike techs were very very good at getting the rear cable replaced and even adjusting the front cable so braking would be even. Makes me feel a lot better about getting my skate skis there too now. Theses guys have really got it on and in a great location on Le Petit Train du Nord too. And just to update all the climate watchers, yes it is snowing a bit but no way near enough to make it all white by Friday. It’s gonna be a BNL Green Christmas. Previous Previous post: Ugly Christmas Sweaters are so last year!